Sometimes just seeing and identifying limb features is all we can accomplish. But with images like this, geologic history can be investigated. Just beyond flat-floored Endymion is a scarp - the main rim of the Humboldtianum Basin. Inside a lower inner ring is the small mare itself, its darkness interrupted by a bold ray on the left (from Hayn) and pieces of rays near the middle. The mare thickness doesn't seem great, for the rim of a large crater protrudes. The mare isn't very extensive laterally either - it laps up against older terrain around most edges. Just outside the inner ring on the south (right) are a series of relatively fresh lettered craters named after Boss, which is south of this scene. The number of craters here, compared to the paucity inside the ring, demonstrates the difference in age of these two areas. On the north it's almost impossible to recognize the big and shallow Bel'kovich, but well seen are Bel'kovich A, a smooth-floored crater penetrated by the small bright crater Bel'kovich B. The local history doesn't begin with the basin, but following its formation Bel'kovich formed, and apparently an early lava flow erupted that is only seen now in the moat between the two rings, where it embays earlier craters. 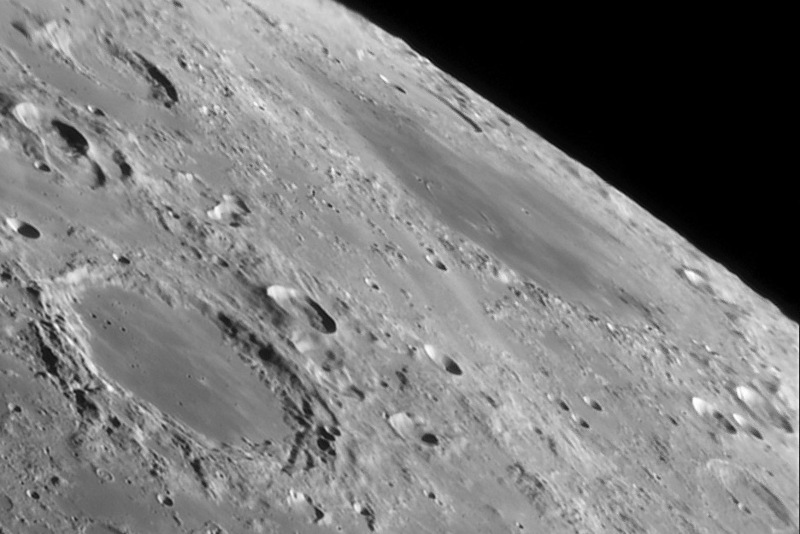 The unnamed crater on Mare Humboldtianum formed as a Triesnecker-like fresh crater, as probably did Bel'kovich A. Later the dark mare lavas erupted in to the low central part of the floor, filling the interiors of the unnamed crater and seeping up faults to flood A. Then Hayn's impact threw bright pulverized ray material across the pristine dark floor, and since them much smaller craters - little pin-pricks of brightness - formed on the mare surface and elsewhere. 29-May-09, 20:05UT. 10in f4.8 Newtonian, Infinity 2-1M, 5x Powermate, blue filter, Avistack, Registax 5, PSE5, Focus Magic. Here is the full mosaic that is cropped from. This page was last modified on 18 August 2018, at 20:34.